The insurance industry is reactive by nature. It’s geared up to be ready once something bad happens. To process claims as efficient and smooth as possible. We are convinced insurance can do better and step in before things go wrong. However, being able to take early actions requires actionable insights on when and how to act. This is what our prevention-platform Fairtrail is all about. Using connected sensors for prevention is nothing new, but the exponential development of connectivity, hardware components, batteries and computing power is rapidly moving us into an era where these type of solutions are not only technically possible but also financially viable. Another important factor is distribution. We have in our onboarding projects to date proven that distribution of effective solutions can be done simple and at a low cost. And when distribution is easy and cost of preventing a future problem is lower than the cost of reactively dealing with it, that’s when things will start to change. We believe that we are in the beginning of a transition where insurers costs will increasingly shift from reactive to proactive. It’s possible and make financial sense already today. Insurers who are early adopters will get lower claim expenses related to e.g. water leakages and over time be able to reduce premiums while providing a greater service to their customers. 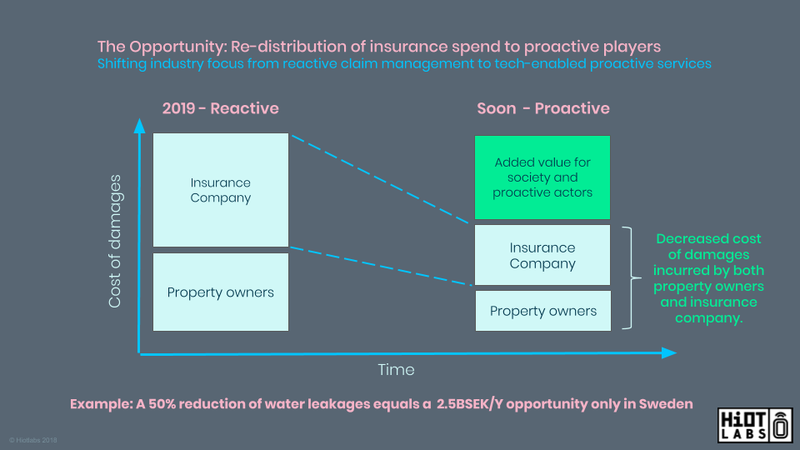 The disruption of property insurance is here, are you ready?